BROWN rice is considered healthy because it is rich in micronutrients. But this nutritious grain is under threat from arsenic. 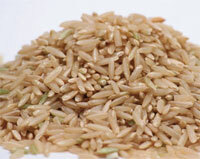 The plum brown rice accumulates more arsenic than the longer rice varieties like Basmati. Intake of arsenic could increase the risk of lung and bladder cancers. An international team of researchers including those from India, chose three villages in West Bengal’s Nadia district. Residents of the area have arsenic-induced skin lesions despite drinking arsenic-free water. Intrigued, the team collected 157 brown rice samples from randomly selected residents and compared them with Basmati rice from market. The researchers randomly picked five grains from each sample and measured their length and breadth. The samples were classified into four categories—short-bold, medium-slender, long-slender and extra-long slender. Basmati rice was categorised as extra-long slender. Next they dissolved the grains in acid and analysed the arsenic content. Arsenic concentration was the highest in short bold types of rice (0.09−0.64 mg/kg), compared to medium-slender (0.06−0.33 mg/kg) and long slender types (0.01−0.24 mg/kg), meaning the arsenic concentration decreases with increasing grain size. About 90 per cent of short-bold and 20 per cent of medium-slender types exceeded the global normal range of arsenic concentration in rice, while 100 per cent of long-slender type rice were within the global range, the scientists found. “Higher concentration in short-bold rice might be due to the development of thicker outer bran layer by complex interaction between environmental and genetic controls,” says Dipiti Halder, lead author of the study. The white rice has lower arsenic as polishing removes outer bran layer which accumulates the heavy metal. Switching to long grain brown rice may help avert arsenic-induced toxicity, suggest the researchers. But will it not be a difficult choice for the residents to shun the rice variety considering it is low cost and nutritious? “Obviously the cost of the long grain rice is higher. We need to improve the living standard of the rural populations,” Halder says. The study was published online in the March 14 issue of Environmental Science & Technology.